Basic Science, Higher Institute for Engineering and Technology, El Arisch, Nord Sinai, Egypt. Received October 29th, 2010; revised December 24th, 2010; accepted May 9th, 2011.
higher temperatu re as the annealing time increased. containers and plant boxes and diapers . rulites grow and impinge with each other longitudinally. injection molding or casting film by chill roll is necessary. 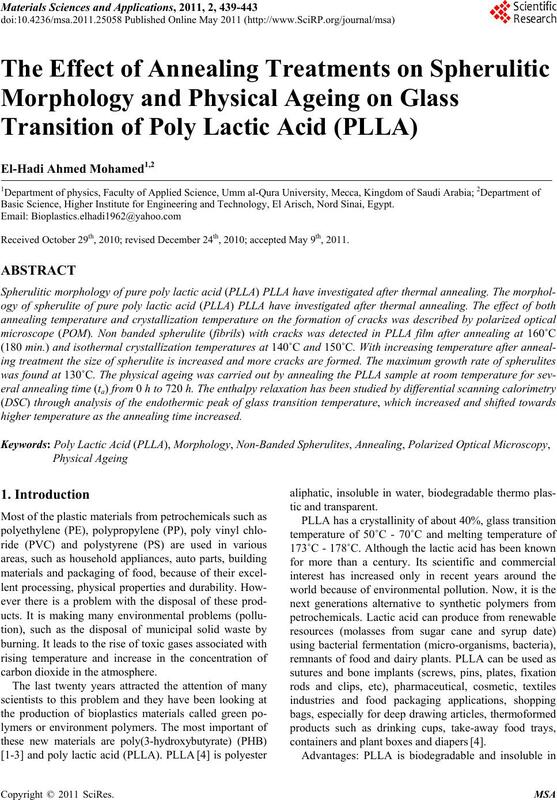 tures observed in the final product of the polymer. cal properties like Young’s modulus and yield stress. mass of 220 000 g/mol. 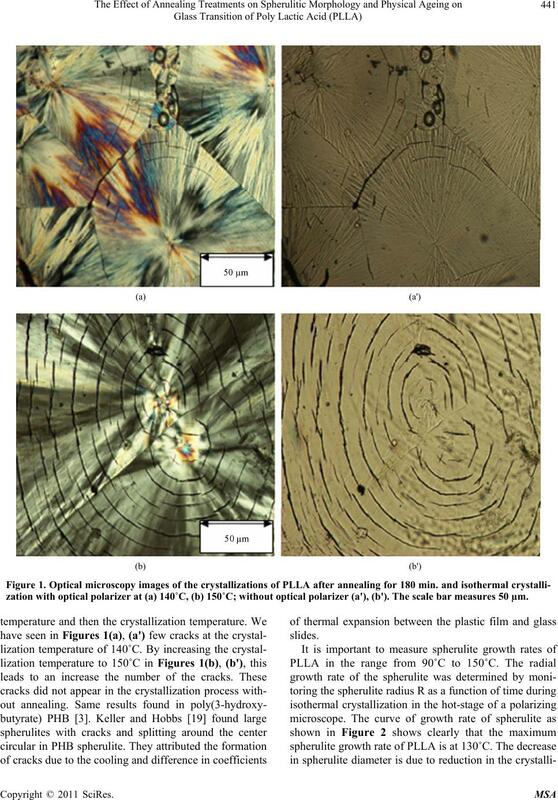 on microscopy glass slide as a thin film (100 - 300 nm). formed at the beginning of the crystal flakes (nucleation). maltese cross between polaroids (polarizer and analyzer). zation with optical polarizer at (a) 140˚C, (b) 150˚C; without optical polarizer (a'), (b'). The scale bar measures 50 µm. make the material more brittle. creased to 62.5˚C after 15 and 30 days. room temperature for 360 h.
(c) 360 h; and (d) 720 h.
project 43005001 (ministry of higher education of K.S.A). No. 5, 2002, pp. 363-372. Test, Vol. 21, No. 6, 2002, pp. 665-674.
berg, Halle and Wittenberg, 2002. Rapid Communication, Vol. 21, No. 3, 2000, pp. 117-132. Vol. 55, No. 1, 2008, pp. 72-77. W. H. Hoidy, M. B. Ahmad, E. A. J. Al-Mulla and N. A. Science, Vol. 105, No. 1, 2007, pp. 282-290. Science, Vol. 39, No. 135, 1959, pp. 101-122. 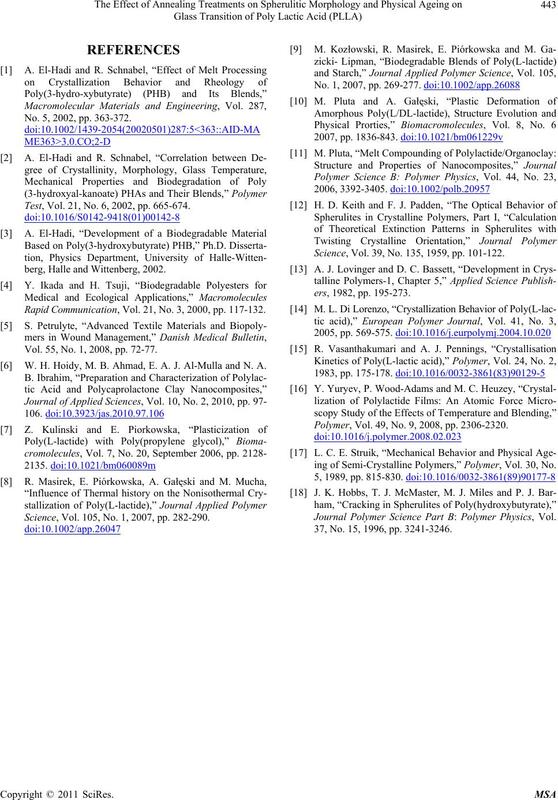 Polymer, Vol. 49, No. 9, 2008, pp. 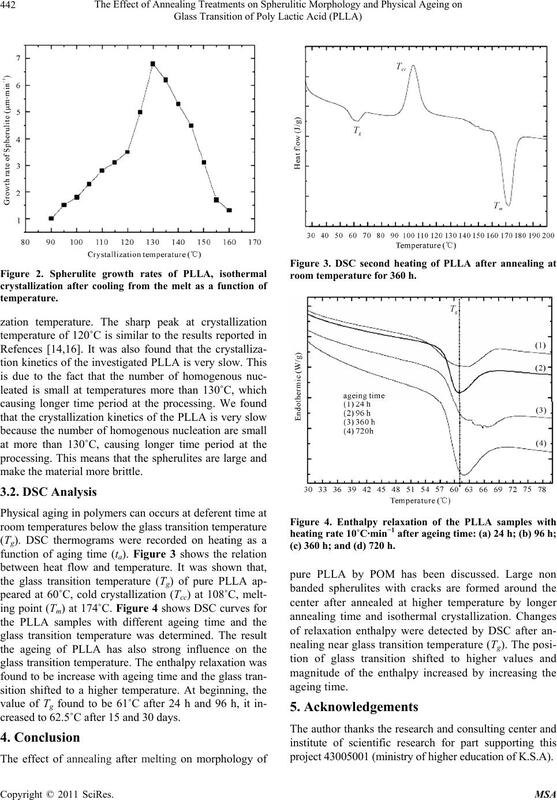 2306-2320.
ing of Semi-Crystalline Polymers,” Polymer, Vol. 30, No. 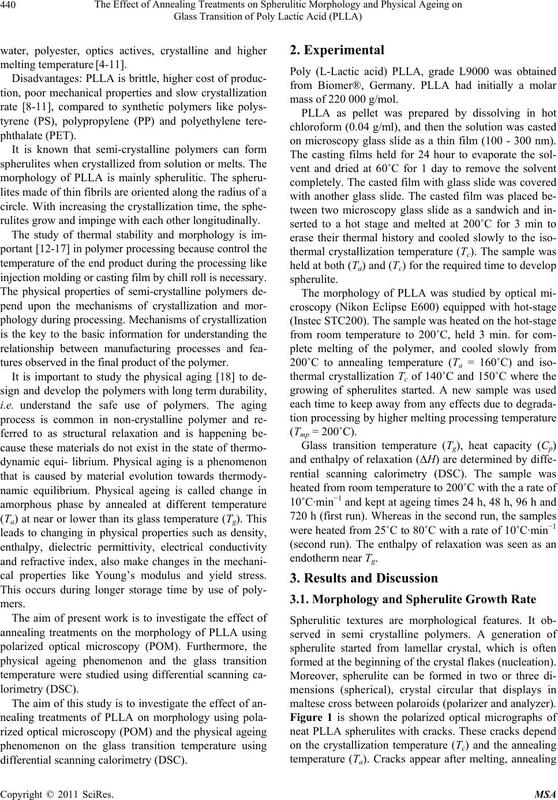 Journal Polymer Science Part B: Polymer Physics, Vol. 37, No. 15, 1996, pp. 3241-3246.